The MÃƒÂ¼tter Museum has launched a unique free service: the Cell Phone Audio Tour Guide, one of the first of its kind in the Philadelphia region. 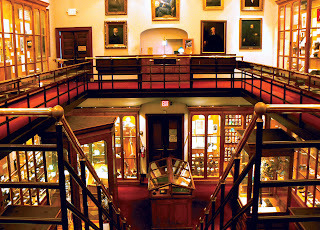 Part of The College of Physicians of Philadelphia, the MÃƒÂ¼tter Museum was founded to educate future doctors about anatomy and human medical anomalies. The College of Physicians uses this collection to enhance the museum experience and promote health literacy, while teaching visitors what it means to be human. The MÃƒÂ¼tter Museum embodies The College of Physicians of Philadelphia’s mission to advance the cause of health, while upholding the ideals and heritage of medicine. The Audio Tour Guide is free and available to everyone. Using commentary provided by the MÃƒÂ¼tter Museum staff and other experts, this interactive tour provides visitors with in-depth information about the museum’s exhibits, while allowing them to explore the museum’s collection at their own pace. Visitors design their own tour by choosing which object they would like to learn more about and in what order. For more information, visit www.collphyphil.org/mutter.